File all important personal documents like financial information on all assets and liabilities, insurance policies, medical information, power of attorney paperwork, advance healthcare directives and/or do not resuscitate orders and more. Ask your employer about the possibility of a flexible work schedule for time needed to care for the older adult, and about paid or unpaid leave. Carefully think through the financial impact of any employment-related changes. Consider the financial implications of providing care for your loved one. Research shows that family caregivers pay more than $5,000 each year for care needs, over and above any lost wages. 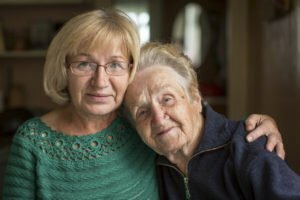 Create an agreement of care between yourself, your elderly loved one, and any other family members or friends who may be involved in providing care. Even though it may seem unnecessary, putting all of the care details in writing helps prevent future conflict. Put together a strategy for continuing support for yourself, to make sure you have time for self-care and to provide a safe, trusted outlet for your personal feelings. Consider available options, to include not only immediate family and close friends, but also a professional counselor or therapist, your place of worship, online or in-person caregiver support groups, and disease-specific organizations, such as the Alzheimer’s Association. Skilled in-home caregivers are a great resource for support for aging adults in need of care, as well as for the family members who care for them. Respite care services help the senior’s loved ones to take much-needed breaks from caring for parents in order to focus on their own personal needs and to have time to rest. The best way to take care of others, after all, is to take good care of ourselves. The Petaluma home care experts at Hired Hands Homecare can provide additional recommendations for putting a plan in place for senior care, and are here to help fill in any gaps with our full range of professional in-home care services. Contact us at (866) 940-4343 for assistance.